This is a montage I made. I enjoy playing with scissors. 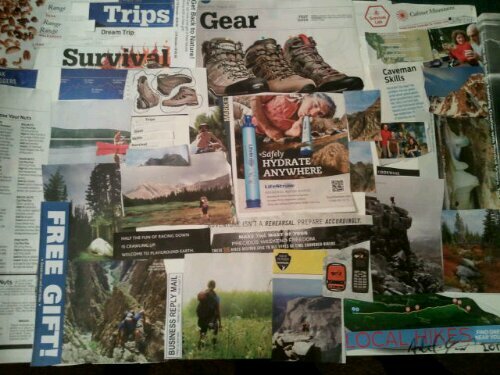 Theres a lot going on here in this two dollar backpacking magazine – destination, preparation, knowledge, technology, friends, challenge, suffering, the “free gift” theme with religious overtones. Decoupling concepts of “range” and “peaks” and “wilderness” from any specific destinations, casting these concepts into a different light. Also _why_ we go outside, that image of a man sucking water from a puddle who would consider that a plus outside of a contrast with our own high levels of comfort? “survival” still somehow a primitive theme (“caveman!”) with those flames again of religious overtone, accepting the risks of “hellfire” to escape … a modern hell.